process of registration and time keeping. registration details can be accessed on www.fssacr.gov.za/ortambomarathon. 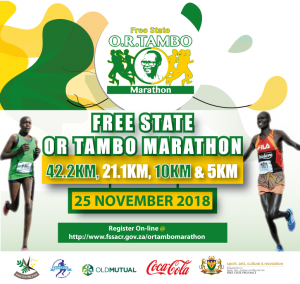 for grabs between the 42.2 KM, 21.1 KM and 10 KM road races. place at Achilles Running Club from 09h00 until 15h00 on 24 November 2018.
specific rules. No entries will be expected on the day of the race. sacrifice and contribution made by this gallant in our country’s struggle for freedom. Your media house is invited to attend this event.